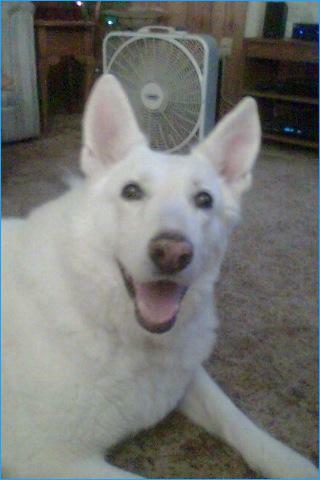 Some of our readers, Kathy and Jim, shared a couple pictures of their lovely pure white German Shepherd, Heidi. 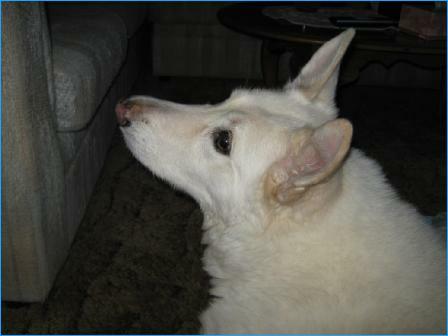 She is definitely struggling with DM, and her wonderful owners have kept in touch with us. I'll add more here in a little bit...check back! 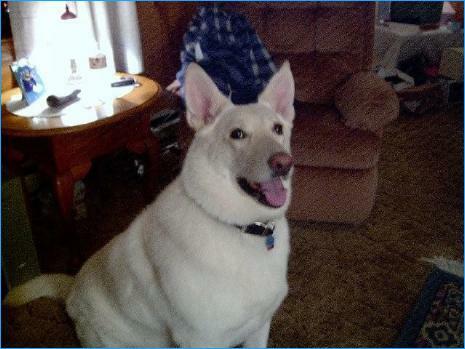 The above is the latest photo from Kathy and Jim, of Heidi, taken December 9, 2009. The above are the latest photos from Kathy and Jim, of Heidi, April 2010. 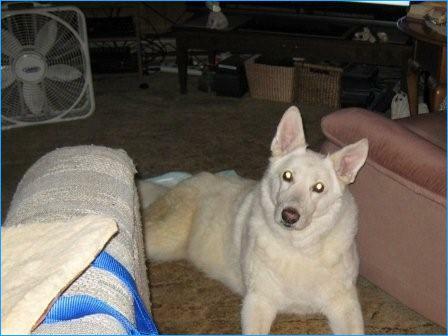 Heidi Snow Angel was gently laid to rest on April 9, 2010. 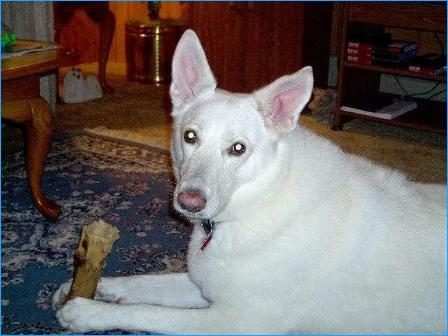 Her passing was expected, she was beginning to reject her favorite treats one-by-one, and was showing detrimental developments with her urinary condition, a possible tumor among other things. 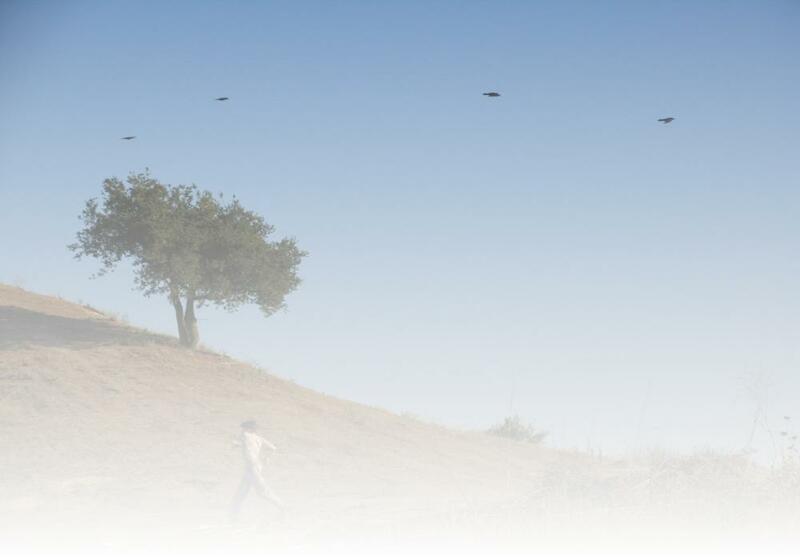 She was letting her family know, it was time to let go. Her passing was not as traumatic as Cora's, but just as heartbreaking. Heidi was also cremated, and her remains are placed in her favorite room, along with a few of her favorite things. Jim and Kathy took some days away to support each other and begin the healing process. And to boot, they are looking forward to a new family member to help them along! 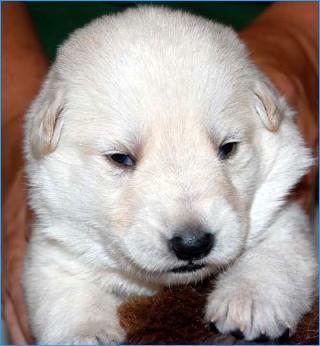 Below is a sneak peek at a little girl, Angel (in this photo, only 3 weeks old, born June 2), that will soon be keeping them busy and on their toes keeping up with her. I know she will receive all the love and care that she will need and deserve, Kathy and Jim have proved it, by sticking with Heidi throughout her long and painful ordeal with DM.